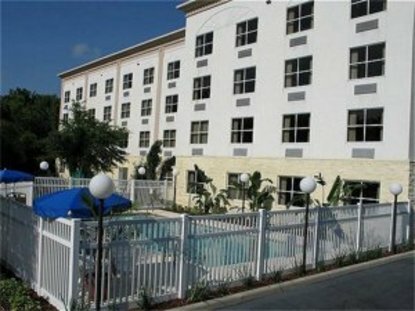 If a smoke free and relaxing atmosphere is important to you, then you need not search any further, the exquisitely renovated Holiday Inn Express Hotel & Suites Plant City is the right choice for youConveniently located off I-4 at Park Road (Exit 22). Only Minutes to Tampa, Lakeland, St. Petersburg, and Clearwater. We are the perfect hotel for Superbowl 2009, an Orlando Vacation to Disney, Universal Studios and Sea World or a weekend getaway to Busch Gardens or Adventure Island. Only minutes from the Florida Strawberry Festival, Sun N Fun Fly In, International Softball Federation, Otis Andrews Complex, Mike Sansone Park and Randy Larson Four-plex.While staying at our hotel be sure to enjoy the Free HOT Express Start Breakfast Bar which features fluffy scrambled eggs or cheese omelets, sausage patties or crispy bacon, flaky biscuits with sausage gravy, juices, fruits, cereals, hardboiled eggs, our own 100% Arabica Smart Roast coffee and the Signature cinnamon rolls you've come to know and love. We feature for all travelers:Free Local Phone Calls, Free Wireless and Hard Wired High Speed Internet Access, Fitness Center, Guest Laundry, Outdoor Pool and Meeting Rooms. We look forward to accommodating all of your needs during your next visit to the Plant City Area This hotel is committed to providing accessible facilities under the American Disabilities Act. If your accessibility needs are not met, please contact the Hotel Manager on Duty. Should you require additional information regarding accessible facilities for guests with disabilities, please call 1-800-Holiday (U.S. and Canada) or contact the hotel directly. For the hearing impaired, TDD service is available at 1-800-238-5544 within the U.S. and Canada.